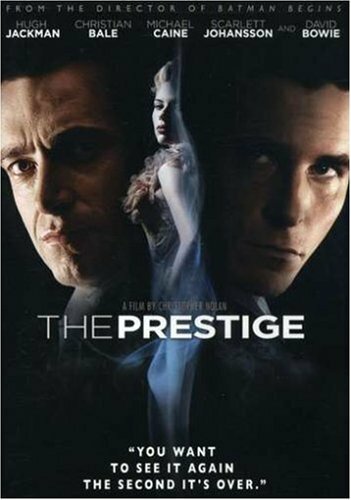 The 2006 mystery thriller film The Prestige, directed by the renown Christopher Nolan, follows the story of two rival stage magicians, Robert Angier and Alfred Borden, played by Hugh Jackman and Christian Bale, respectively, in late 19th century London. The intense competition between these two brilliant magicians, both obsessed with creating the best stage illusion, leads to a spiral of one-upmanship and sabotage that eventually ends in poignant tragedy. The complex narrative and morally ambiguous characters embody The Prestige with the same quasi film noir atmosphere as Nolan's larger scale epics, such as The Dark Knight Trilogy and Inception. The film opens with John Cutter (Michael Cain) performing a simple illusion, involving a bird and a cage, for a young girl. While he performs the illusion, Cutter explains that every magic trick consists of three acts: the pledge, during which the magician presents the audience with an ordinary object (the bird); the turn, during which the ordinary object is made to do something extraordinary (the bird and cage disappear from under a cloth); and lastly the prestige, the hardest act, during which the ordinary object is brought back (the bird reappears in his hand). These three concepts provide the foundation for the rest of the film's events. At the beginning of The Prestige, Angier and Borden are working as shills (assistants who pretend to be part of the audience) for the same performer, Milton the Magician. Cutter works as Milton's trick engineer and Angier's wife, Julia, as his alluring stage assistant. When Julia drowns while performing a water escape with hands bound, the two men's relationship is destroyed, as it was Borden's job to tie her hands in a way that she could free herself. Angier accuses his friend of using a previously proposed alternate knot instead of the standard one. When Borden replies that he doesn't remember which knot he tied, Angier lays all of the blame for his wife's death on him. The pair immediately go their seperate ways and become magicians in their own right. While the viewer can consider Borden to be the more talented magician, Angier's excellent showmanship has a greater appeal and grants him more fame. Borden begins performing a trick, The Transported Man, wherein he disappears from one closet and emerges from another a few meters away. Angier calls it the greatest magic trick he's ever seen and, though he can't figure it out, in response he creates a trick, The New Transported Man, wherein he walks through a doorway, disappears, and reappears through another doorway a dozen meters away. Angier however is not satisfied since his trick employs a double while he is certain that Borden's trick does not. This dissatisfaction leads Angier to meet with genius inventor Nikola Tesla, who he employs to create a machine which will allow him to truly perform his trick. Though the device Tesla creates does allow Angier to perform his trick, The Real Transported Man, it comes with the terrible cost of an unexpected side-effect, one that leads to the superbly climactic ending and astonishing reveal, or prestige, of The Prestige. Have you been watching closely? While the constant competition between Angier and Borden grant the film its power, this reveal is what makes the The Prestige truly stunning. Littered throughout the movie's rich narrative were hints foreshadowing the gripping final scenes. This is not to say that the reveal and final scenes of the movie casts a pall over the rest, or even that the end is the best part. Instead every moment of the twisting, turning, intricately crafted story captivates the audience; the end simply complements the plot as a whole, bringing every element together while leaving the viewer with the desire to immediately rewatch the film. Of course The Prestige requires its audience to suspend disbelief, but if one is willing to do so, to accept the movie's premise, the story can only be judged as an innovative adventure without equal. "Now you're looking for the secret, but you won't find it because of course you're not really looking, you don't really want to work it out, you want to be fooled"
The part of The Prestige that I found the most thought provoking was the nature of the repeated “cloning” of Angier by Tesla’s machine. At the end of the movie, when the remaining Borden twin tells the dying Angier that he wouldn’t know anything about sacrifice, the latter replies that it took courage to walk into the machine every night not knowing whether he would end up in the prestige or in the tank of water. So though there are two living Angiers for a few seconds during the magic act, Angier’s soul only inhabits one of the copies at random. Therefore, to routinely perform his act the Angier copy in question either killing himself or someone else; this is the cost of the machine Tesla mentioned earlier in the movie. It becomes really interesting when one thinks about the first time Angier copied himself (to test the machine) and then gunned down the copy. We instinctively believe that, during the test at least, the man who got shot was just a copy and that the true Angier remains; the possibility that it was the true Angier who was killed goes overlooked. Certainly Angier himself probably expected the machine to make a copy of him and leave the original him, inhabited by his soul, in place. This expectation would be based on the assumption made when his top hat was copied: the original hat is staying in place and a copy is being produced outside. We don’t stop to think of the possibility that the original is being moved outside and the copy is taking its place. With that in mind, there is a good chance that the real Angier was killed during the very first test and never got to experience the prestige he desired so much. Angier placed a gun within reach and then turned on the machine with the intention of killing the other him that would appear in the room; the copy would have been produced with the same last thought in its head. The man who appeared in front of the machine looks down at his body in wonder. Though we associate this self-contemplation with the act of creation, a new being stunned by suddenly existing, this kind of shock would not be present. Instead the person produced outside the machine, whether copy or real Angier, would be shocked that he was transported across the room, since his last memories have him standing in the machine just before the copying. The person still standing in the machine, again whether copy or real Angier, would also have all of Angier’s memories and would therefore not feel any shock. This person would still be focused on killing the other man that appears in the room and did just that, cutting off the other’s protestation: “wait, wait, I’m not...” The viewer can only ask himself, was the rest of that sentence going to be “...the copy”? The importance of memories in Tesla’s machine again comes into play during the repeat drownings. Whether the person who steps into the machine becomes the prestige by transportation or whether the copy is the prestige, because Angier’s soul only inhabits one of these two people, the survivor never has any memory of drowning since his memories only extend to standing in the machine just before the copying. This allows the surviving Angier, still comforted by Cutter’s assertion, earlier in the movie, that drowning feels like going home, to perform the act again the following night despite the guarantee of either murder or suicide. The importance of this comfort is shown at the end of the movie when Cutter declares that he was lying, and that drowning is actually agony. Angier looks shocked and lifts his lantern to peer into one of the nearby tanks containing a body, realising that the people he has been killing by performing his act died horribly.